The famous Movie Colony is a few blocks from where I live. Some of the homes are small estates with their own private beaches. Pardon delay in answer to yours 12th.inst. Have been busy getting settled in my new place, know you will understand. Pleased to know you recd. the picture Ok for Miss Janice Mastro. I doubt if you will find Malibu on the ordinary map as its practically a suburb of Santa Monica, (20 mins. drive) mostly residences & lots of fish restaurants, one or two grocery stores, Bank & Post Office - fishing pier etc. I guess you can picture the type of place. The famous movie Colony is a few blocks from where I live, some of the homes are small estates with their own private beaches. Should you be coming down this way during the summer, I would enjoy having the pleasure of meeting you in person. My phone No. is GLOBE 68214, call first to be sure I'm home. I wrote to Mr Wade in regard to his sending you the address you wanted - hope by now you've heard from him. Please convey my thanks to your club members & self for the birthday greetings, your remembrance was much appreciated. The famous Movie Colony is a few blocks from where I live, some of the homes are small estates with their own private beaches. Sorry delay in answering yours 18th.ult. Had quite a busy time moving & getting settled again, know you will understand. Weather is very nice here, plenty of sunshine & not too hot, I like living on the beach very much, the ocean air is very invigorating & makes you feel real good. I have been married to the present Mrs L. about 11 years. I have a daughter by a former marriage, she is married & has two children (boy & Girl). She & her husband have a small ranch in Tarzana, about 20 miles from here in the San Fernando Valley. You may remember my Son-in-Law, he played the part of 'Lucky' in the Hop-along Cassidy series on TV. He is now currently working in the "Rin Tin Tin" series. Sorry to say Mr Hardy is still in bad shape, no sign of improvement - poor fellow, wish something could be done for him, but the situation is not very encouraging. All for now Elmer, trust alls well & happy with you. Billy Gilbert was in many films with us—a nice fellow and very capable—with years of solid experience. Please pardon long delay in acknowledging yours of May 28th. Reason is, we moved from Franklin St. & are now living in an apt. The house was too big for just the two of us & a lot of hard work for Mrs. L. to take care of (7 rooms, 2 baths, gardens, etc.) so we decided to rent the place to a family & take an apt. Hence the new address. Needless to tell you it was quite a job moving out of the house as the tenants wanted it unfurnished. I gave a lot of stuff to my daughter & the rest was put in storage - managed to sell quite a bit of it too, to cut down storage expense - did'nt need any of it as the apt. We moved into is furnished, brand new building so everything is modern & new. The place is ideal for us:- one large living room, bedroom & bath, the kitchen is part of the living room which is half divided with a counter electrically equipped, oven in wall, garbage disposal etc. there is a raised brick fireplace, a big plate glass window the size of the wall with sliding doors onto a large open balcony overlooking the ocean, plenty of room to have meals & entertain really nice. The only drawback so far is, the TV reception isn't good, unless a special antenna is put up, so I guess I'll be forced to have one as TV is very important to me, in fact my only connection with show bus. I am quite a fight fan too, so my sport seeing is upset. Anyway, if it comes to the worst, I'll buy myself a bulldozer & cut down the hills that cause the interference!! Was sorry to hear that your house deal did'nt work out, but I think you are better off living at the Motel maybe later you will find something to your liking - more modern. Yes, I read about Stroheim passing on & too was sorry to hear about it. The old ranks are certainly thinning out. Thanks for the Billy Gilbert clipping I've had that contention for several years, its not over exposure, its the material that burns up, for the comics, they can go on for ever as long as they have something to deliver, what gets them down is the nervous worry of what to do next. You can't face a million people every week without proper preparation & if a good show isn't in the cards, even if you have material it can't be handled without thought or care. Of course many comics figure to make a lot of money quick & get out they do'nt look for prolonged glory - maybe they're right! Yes, Billy Gilbert was in many films with us, a nice fellow & very capable, with years of solid experience. I really don't know why foreigners are not permitted to look at the Royal Family at a Command Performance. Maybe it's a tradition. I doubt if it would affect the artist in any way, even if they are at attention when appearing before Royalty, they still retain the "Show Must Go On" attitude, regardless of anything. Frankly, I think it's ridiculous to enforce this rule. A little peek wouldn't hurt anybody. (I know it because I did). Sorry to say poor Babe is not improving - unfortunately I understand this can go on for years, I am told that Mrs Wrigley (chewing gum family) has been in this condition for over 20 years & still confined to bed - is'nt that awful? eve with all their money nothing can be done for her, I think I'd prefer wings & sitting on a cloud to that.! Have been following the 'Confidential' magazine case - it certainly should be banned & others of its kind, its disgraceful. Note 'Cindy' is eight months old now, you'll soon be getting a thrill when you first see her walk & really talking - something you'll never forget - will enjoy seeing a picture of her if you have one to spare. Re Hawaii, I spent three weeks therein Honolulu in 1930, enjoyed it very much - had some wonderful fishing trips. I understand since then the place has become very commercial, everything designed for Tourist Trade & of course very expensive - after a few weeks you've seen everything & you begin to feel a bit isolated & have a great desire to get back to the mainland, you get a bit tired of pineapple & the native foods, but the bathing at Waikikki is out of this world - only a small section of beach but the water is wonderful, you can stay in for hours day & night & never cold. (with till I get my hat - I'll go with you!!). Yes, it now looks like we are going to get a Ball Club out here, they've talked about it for a long time. Am not too interested, in fact I never saw a game played, much prefer soccer football - do'nt care for American football (Rugby). The only sports I like are fights & soccer. Abbott & Costello seem to have died out - I have seen Costello a couple of times recently on the Steve Allen show - working alone, looks like they've split up. Abbott is quite a drinker, that maybe is the reason. How do you like Jerry Lewis alone? there seems to be a lot of pros & cons on that split. I think they were foolish to seperate. All for now Earl, sorry took so long in answering, but am sure you understand. Mrs L. joins in kindest regards & best to Jeannie, Self & 'Cindy' - trust alls well & happy. P.S. A friend of mine sent me the enclosed card. This is to be handed to females only - be careful who you hand it to - some dames have no sense of humor! don't sue me if you get a punch on the nose! Erich Von Stroheim (1995-1957) was an Austrian director, actor and producer during the silent era. On May 27, 1957, National League owners voted unanimously to allow the New York Giants and Brooklyn Dodgers to move to San Francisco and Los Angeles, respectiovely. Please pardon delay in acknowledging your nice card & letter of day 23rd. & 3Oth.ult. Reason is, we rented the house on Franklin St., it was really too big for just two of us & a lot of hard work for Mrs L. to take care of, so decided to move into a small apt. We had a hectic time moving out of the house as the tenants requested to come in earlier than we had arranged, so you can imagine the wild scramble to get out, we rented it unfurnished so everything had to be taken out - gave a lot of furnishings to my daughter, sold quite a bit & the rest was taken into storage. To top this off, we did'nt have a place to move to so had to take a room at a Hotel in Santa Monica for a month while we looked around for something suitable - after a couple of weeks looking & listening to the ridiculous 'SUMMER' prices (3 to 5 hundred a month) we finally came across this place & took a years lease. A brand new building with newly furnished Apts. & right on the beach - just ideal for us as Mrs L. loves to swim & we both like the ocean dept. The place is very modern, large living room with combined kitchen, electrically equipped, oven in wall, Garbage disposal. There is a raised fireplace - seat around it, A large plate glass window - (the size of the wall) with sliding doors opening onto a good sized balcony overlooking the Ocean, plenty of room to sit & have meals out there. Nice bedroom & bath etc. Really very nice, know we shall be very happy living hear. Its just a few blocks beyond the famous Movie Colony which are small estates with private beaches - when you come down to visit us you'll be in select company! lncidently tell Mr Hatfield to be sure & put on his best BIKINI!. Note he studied voice at the City College & private teachers - having something in common, Mrs L. will enjoy meeting him. I used to have a nice voice till I ran a nail through it & got rusty! Sounds like you had a wonderful trip to Carmel & your drive through Castroville, & the miles of strawberries must have made you wish you'd brought a bottle of cream & some sugar or a quart of ice cream!. I've been through there, it is a sight to see. I see where Mr Summerfield has raised the price for Special Delivery - 20 to 30 cents, it'll soon be cheaper to make a trip instead of writing! This inflation business is getting out of control, its really getting serious for both Capitol & Labor - can you imagine paying a dollar for an egg? you do'nt , but can you imagine!!. Well enough of this persiflage - I think the sea air has got me! Mrs L. joins in regards & best to you both - will look forward to the pleasure of seeing you soon now. P.S. our new phone number is:- GLOBE 68214. We found a very nice little Apartment here in Malibu—a brand new building right on the beach only about 40 feet from the water. The front balcony overlooks the ocean. Thank you for your nice letter of May 20th.ult. Sorry I took so long to acknowledge, reason is I rented our house in Santa Monica, the place was too large & a lot of hard work for Mrs Laurel to take care of now that I am unable to help her, so we decided to move into a smaller place to make things easier for her. The house had seven big rooms & two bath rooms, so you can imagine all the cleaning to be done - 24 windows with venetian blinds - it was really a big-job, lawns & gardens had to be kept up too, all unnecessary for just two people. However, we found a very nice little Apartment here in Malibu, a brand new building right on the beach (sands) only about 40 feet from the water, the front balcony overlooks the ocean. Mrs L. likes to swim, so the place is ideal for us, only one big living room with built in kitchen, one bedroom & bath - all we need & very modern, Its a nice section & just a short distance from the famous malibu Movie Colony, all the well known Stars have homes there, they are small estates with private beaches, we are very fortunate in finding such a beautiful spot, so I think we shall enjoy the change very much & I think the sea air will do us both a lot of good. We get about 8 months summer here & the winters are very mild - just a rainy season - no snow. We rented our house unfurnished so it was quite a job moving everything into storage. However it was worth all the trouble. Did you ever ask the old lady that lives near you about the old 'Blood Tub'? I imagine she would remember it well, it would be interesting to hear her remembrance of it, she must know of everything that ever happened in Blyth at her age, she's as old as the 'Wooden Dolly' in No. Shields. Incidently, I heard they are going to have a new one there - I think this is the 3rd. or 4th. now, that was really a land mark. Well, not much to tell you this time so will close. Trust alls well with Mr Short & your kind self & thanks again for your lovely sentiments - deeply appreciated. 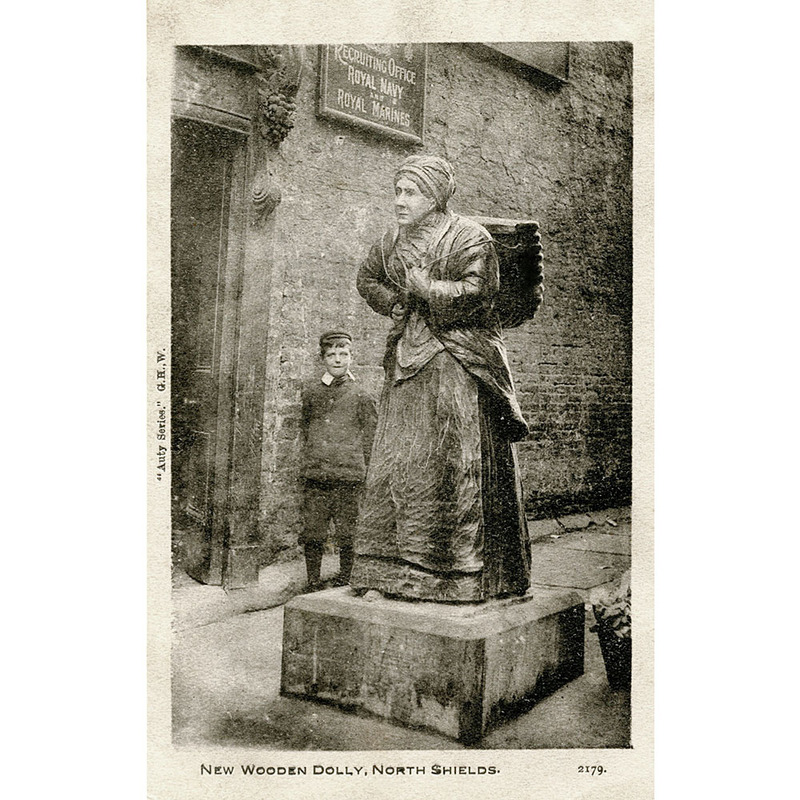 VINTAGE POSTCARD - "THE WOODEN DOLLY"
This postcard depicts the “Wooden Dolly” that Stan would have recognized from his time in North Shields. Since it was originally placed on the quayside in 1814, it has been replaced four times because sailors used to cut pieces from it to bring them good luck. Sorry delay in answer to your nice letter 3rd.ult. reason is, we rented the house on Franklin St. & moved into a small apartment. The house was too big for just the two of us (7 rooms 2 baths etc.) & was a lot of hard work for Eda to take care of, so decided we would be better off to live in a smaller place. This is a brand new Bldg. & the apts. are newly furnished & right on the beach here (sands). There is one large living room with a built in Bar Kitchen — one bedroom & bath, practically no work at all. The living room has a big raised fireplace (stone seat around it) & a large window the size of the wall with sliding door onto an open balcony which overlooks the beach & ocean — plenty of room to eat your meals out there & entertain a few people, the place is very modern & very attractive, so we shall enjoy living here very much. Only 20 mins. drive to Santa Monica & its quite close to the famous Movie Colony, the Stars homes there are small estates with private beaches, so we are in a nice section. Eda loves to swim & take sun baths, so the place is ideal for us, I'm sure the change will do us both a lot of good. Wish you could see it. I too had a nice letter from Georgie after he was out of hospital, said he was feeling much better. I was pleased to know he wrote you & am sure he will visit you if he comes to Sunderland — I sure enjoyed seeing him again when he was here. Glad to note you recd. the stationery OK, it took a long time to reach you. I haven't heard from Jackie for a while, but I hear quite often from his Grandaughter in Liverpool, I think she's about 15 years old & has a desire to get into show bus. she sounds like a cute girl & seems to have good sense. Was sorry to hear about Benny Barron not being too well, he's such a sweet fellow, if you see him again, give my love & best & kind thoughts. Glad to hear you are having nice warm weather for a change, hope it lasts for a good while. Sorry to say Mr Hardy is still about the same — no improvement — very discouraging after all this time (10 months now), poor fellow. Well, think that's all for now dear. Eda joins in love & best. Bye & God Bless. Take care of yourself Hinney! Do not know how long I shall be in this wonderful hospital, but I'm here for bloiod transfusions and treatment. During my recent time in California I was frequently with Stan (in fact the package you sent him arrived the day before I saw him & just as I phoned him). He sent his best wishes in which I join. He is almosty better. My recovery is still uncertain. Every good wish. We moved in last Wednesday and are enjoying it very much. Wish I’d done this long ago. Sorry delay in writing, but as you can imagine we had a hectic time with the moving dept. Our tenants requested to come in earlier than expected, so it turned out a last minute rush - we did'nt even have a place to go to, so had to take a room at a hotel in Santa Monica for a month to give us time to look around. After a couple of weeks searching, we finally came across this apt. right on the beach - just what we wanted for a long time (tell Wayne we've got crabs & everything!). Its a brand new building & the apts. are newly furnished, very modern & real nice, One very large living room with a kind of a Bar kitchen built in, All electric, wall oven & garbage disposal. There is a nice raised fireplace - A big glass window the size of the wall with sliding door which opens onto a good sized balcony overlooking the beach & Ocean, plenty of room to have meals out there & entertain. We moved in last Wednesday & are enjoying it very much - wish I'd done this long ago. Hows everything with you? hope you & Wayne are well & your business deal is working out good - will look forward to hearing how you are getting along. Eda is having a wonderful time taking sun baths on the beach & swimming, she is able to take it easy now with not so much work & cleaning to do - the change should do us both a lot of good. I had to take a years lease so if it agrees with us living on the beach, I may sell the house, buy a beach lot & build two or three apts. - live in one & rent the others for income. I just bought Eda a '57 Chevrolet 'Bel-Air' with power steering, the Mercury we had was too hard to drive for her, every time she had to park etc. it bothered her heart. Expect the Chevy will be delivered today, so she is looking forward to the thrill of owning her first car. Think thats all for now Betty. Eda joins in love & best to Wayne & self. Thanks [Gary Arnold] your card 1st.inst. Pleased to know you finally heard from Mr Wade. I mailed a letter to you last Monday - guess you have recd. it by now. Am enjoying the new place very much the weather is wonderful - just right, being near the ocean. Bye Gary. All the best. Very interesting to hear of your early association with Malibu, I remember the Lew Cody home very well, but do'nt think I could find it now on account of so many changes around here, a lot of the old land marks have gone - like the Thomas Ince movie sets etc. & of course this present Movie Colony was'nt here then. Happy to know you & Wayne will be able to come & see us - any time you feel like it will be fine, do'nt bother to bring anything in the lunch dept. we'll take care of that - just give us a call (Globe 68214) & let us know when to expoect you, so we're sure of getting it in time & be on the look out for you. Was sorry to note your real estate bus. is'nt too good, however, I think if & when they may get some industrial plants going up there, things will change & a real boom will start, so do'nt be discouraged, your efforts & knowledge of the business will be of value to you when the time comes. In the meantime, you are making a good move in taking the Civil Service Exams, especially as its connected with real estate, sincerely hope you will find a spot in one of the departments, I imagine they pay pretty good money for skilled jobs & responsible positions, which am sure you would be very capable in handling. We ran into some trouble with the ar, the first drive was to Santa Monica & discovered there was a leak in the transmission oil dept. & the oil pump was'nt working, you could smell the heat of the motor two blocks away. However the dealer came over from Van Nuys & loaned us his car till ours was fixed - lucky we found out in good time. Think thats all for now Betty. Eda joins in all the best to Wayne & self & looking forward to meeting you both real soon, its really nice here - know you will enjhoy it, be sure Wayne brings his best BIKINI! Many thanks your very interesting letter 9th.inst. with enclosure of the clipping regarding the new 'Wooden Dolly'. A friend of mine just sent me some post card pictures of the new Tyne Tunnel. Its certainly a wonderful project - I told my friend, he would have to wear his Sunday clothes everytime he went through it, its too nice to gen through in yer bare feet! It looks like they are really modernizing the old Tyneside, I would'nt be surprised if the new 'Wooden Dolly' looks like Marilyn Monroe, they'll probably have a water tank in her Creel to keep live Silver Herring!. I imagine the old 'H'appney Dodger' (Tyne Ferry) will be going out of business & one of the discarded Navy Battleships will be used instead. I guess the old folks you talk to about the 'Blood Tub' get quite a kick reminiscing over the old days, I think that show the old chap remembers seeing last was 'The Third Alarm' (not 'Night Alarm') I saw it many times, it was a story of a Fireman, quite a thrilling melo-drama - burning bldgs. etc. If I remember correctly, they had a fire engine & horses come on the stage - very spectacular. I hope the old Lady did'nt feel insulted at my reference to her as being as old as the Wooden Dolly, I did'nt mean to be disrespectful, it was only in the spirit of fun - please explain that to her. Was sorry to hear of your disappointment with the Managers of the Theatre Royal, I think a person running a local Cinema would be more courteous to their patrons, she certainly shows very bad taste in treating you in that manner, she could have at least written you a little note on returning your letter. Anyway, do'nt worry about it, she just does'nt know any better. It was very interesting indeed to read your letter that appeared in the Evening Chronicle, bequeathing your eyes & Bodies to go to the R.V.I. & Medical school, that was certainly a wonderful gesture. Over here, people are paid for this, hospitals will buy your body in advance & after a death will have claim on it for research - I think I'd get about Fourpence Three Farthings for mine, think I'll wait till prices go up!! I'm at least worth a Bob! Well, think I'll be gaan hinney, thanks again for your kind thoughts & wishes - enjoyed hearing from you again. My kind regards & best to Mr Short & self, trust alls well & happy. Sorry so long in acknowledging your nice letter of June 1st. As you know we have been busy moving and have'nt had time for correspondence. We found a nice apartment here, a brand new building & right on the beach (sands). We have been here now two weeks & I like it very much, think living by the ocean will do us both a lot of good. The apt. is newly furnished & so much easier for Eda to take of. Just had a letter from Georgie Wood. he's been quite ill & in hospital, but says he [is] back home again & feeling much better. Pleased to know you are having such nice weather, hope you will get a good share of it this year. Your mention of the Electric train rides to Tynemouth for a 1D return, bring back many happy memories, I [re]member I used to go to school in Tynemouth & ride the old steam train every day, that was quite an event for me to go by myself with my school bag strapped on my back - wearing knickers & cap! Sometimes I had to walk. I spent my fare on mint Black Bullets!, they used to sell big ones at a penny apiece - I asked the lady in the shop once, how long she would let me have for a H'appney, as I only had that much & she would'nt cut one in half - anyway she gave me one on the promise to pay the rest later! Bye Mary dear, take care of yourself & God Bless. Thanks yours 8th.inst. also Post card. You say you have asked for 17 autographed pictures, Do you mean you want me to send them to you? I have no knowledge of your asking for them before now - maybe I did'nt receive that letter. However, I shall be pleased to forward some on if you will send me the names of your members. Sorry I overlooked answering your question regarding playing chess - No I do'nt, its a bit too complicated for me, I used to play checkers a bit, but I prefer card games, everything in that line except Bridge & Pinochle. My favourite card game is Samba (Canasta with three decks), thats a lot of fun & very exciting. If I happen to be in Fresno sometime, I shall be delighted to pay you a visit - thank you for the invitation. Bye now & best wishes. There is still a big demand for L&H pictures - many from L&H Clubs. Alf Goulding sure is a mystery. It's possible he could have gone back to Australia - his chances there for TV would be much better. Too bad he's such a mixed up guy - his own worst enemy. Quite a while since hearing from you, am wondering how you are getting along. Trust Lawrie you are feeling OK again after your session in hospital & doing all right in the working dept. You will note our new address, we rented the house in Santa Monica, it was too big for just two of us & a lot of hard work for Eda to take care of, so we decided to move into a small furnished apartment to make it easier for her. Fortunately we found a very nice place, a brand new building & right on the beach here in Malibu, its very attractive & modern so we are enjoying the change very much. Eda swims & takes sun baths every day & having a wonderful time. A couple of months before we moved, Billy Marsh & Georgie Wood came out to see me several times, needless to tell you we had a grand time together. Sorry to say poor Babe is still the same, going on 11 months now & no improvement - pitiful is'nt it? Well kids not much to tell you - just hope alls well & happy with you both. Drop us a line when you have time, will look forward to hearing all the news. Thanks yours 13th.inst. also your card of the 22nd. Appreciated the vote of thanks from the members & self for the pictures & stickers, it was my pleasure. Note you are not getting to see many of our films lately, I think they run them once a week here on a Saturday morning. If you like playing Canasta, am sure you will enjoy Samba (three decks), its much more exciting - with six players we use 4 decks & make the full score 15000.instead of ten thousand, you should try it. I like living in Malibu very much & expect to be here till June '58. My regards & best to you & all. The film you mentioned that was announced on Movie Museum was called "Two Tars." It was a silent two-reeler. It was a story of two sailors on shore leave who rented a car and caused a big traffic jam - all account of the car in back of them accidentally bumping into them without any damage at all. It ended up with all of the car owners in the line also getting into an argument which many of the cars were wrecked and smashed beyond repair. Everybody was really fighting mad. Yes, Mr Hardy is married - no family. You sure have been getting some hot weather - 97 degrees. It's 80 degrees here today, but its not so bad on account of having some sea breeze with it. I sold my tape recorder when we moved, so I'm going to get a new one called a Wollensak. It has two speeds like my old one but only weighs 18 pounds. It costs around $190 - plus tax - from Chicago. The Webcor I had was much too heavy for me to carry around, so this one should be easier for me to handle. Well, all for now Elmer. Hope alls well with you. Thanks your letter just recd. Pleased to know you are all having a good time with the club. You ask me to give you some suggestions, frankly, I would'nt know what to tell you, as I have no idea what you are doing in the way of entertainment - have you a movie projector? all I could think of is to run some L&H films which could be rented or bought for a reasonable cost - each member could help pay for this once a week or a month, you could also run other films too. There is a firm who you could write to for a catalogue, they have all kinds of films to choose from (in 8mm & 16mm) drop them a card & they will send you their listings. The address is:- Blackhawk Films, 515-19, Main Street, Davenport.Iowa. Regards & best to you all.